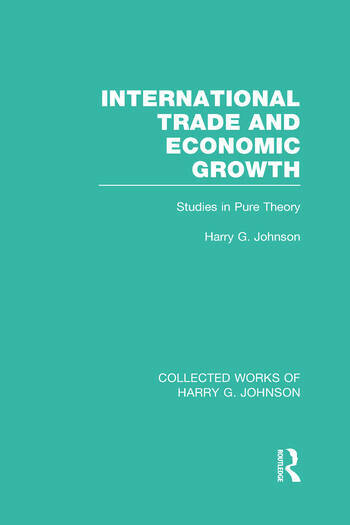 The studies collected in this volume embody the results of research conducted in the mid 1950s into various theoretical problems in international economics. They fall into three groups – comparative cost theory, trade and growth and balance of payments theory. This volume consolidates the work of previous theorists and applies mathematically-based logical analysis to theoretical problems of economic policy. Part 1: Comparative Cost Theory 1. Factor Endowments, International Trade and Factor Prices 2. Optimum Tariffs and Retaliation Appendix to Chapter 2: Alternative Optimum Tariff Formulae Part 2: International Trade and Economic Growth 3. Economic Expansion and International Trade 4. Increasing Productivity, Income-Price Trends and the Trade Balance Appendix to Chapter 4: The n-Country Case 5. Equilibrium Growth in an International Economy Part 3: The Balance of Payments 6. Towards a General Theory of the Balance of Payments 7. The Transfer Problem and Exchange Stability 8. A Simplification of Multi-Country Multiplier Theory. Index.